Not to mention the fact that my TBR (especially the part of it with review copies) is EXPLODING in my face and I can't seem to keep up with it AT ALL. 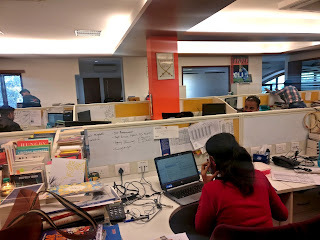 So, to escape the mundane schedule and ALSO to go for my littlest sister's fourth birthday party, I ran away to New Delhi, the capital of India and home of all the big publishing offices in India. 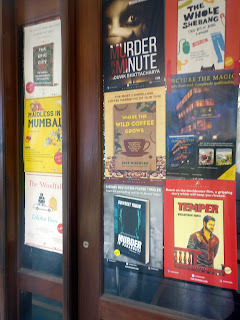 Located about twenty minutes away from where I was staying, the first thing I saw when I entered the Bloomsbury offices was all the POSTERS OF ALL THEIR LATEST RELEASES (along with the signboards that pointed me to their office) I had a few mild (okay, very many) freak out moments as I walked through the doors and up the two flights of stairs that it took me to stand outside the door. I just stood there like the awkward potato of a human that I am for a good few moments before I walked in the door and smiled at the receptionist. The first thing I noticed, unsurprisingly, was a signed postcard of the cover of the Illustrated Edition of Harry Potter and the Prisoner of Azkaban and I smiled, knowing that I was in a place filled with books and that nothing could go wrong here. After a few minutes of awkward fumbling (again) I finally saw Sneha from across the room and we ran across and hugged each other. I loved this office so much, not only because of the lovely bookish people but also because there were books EVERYWHERE, and it felt like home. I spoke to the publicity team for a little while, while Sneha showed me a few of their newer releases that were sitting on their shelves and ready to go out into the world. It was a surreal sort of feeling, sitting there and talking to the people I communicate with via email face to face. Sneha then took me on a tour of the office. 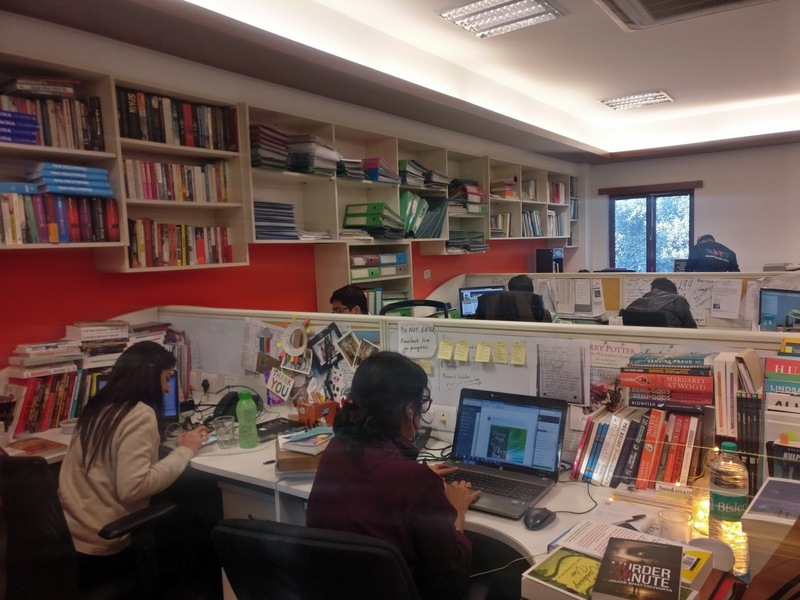 The Bloomsbury Offices are moderately sized but the important part is that they have books absolutlely everywhere and that makes it Heaven on Earth. We walked past the accounting and business team and then past the professional book editors (for study guides etc) and then we entered my favourite part of the office - an arch made of book surrounding the area where Bloomsbury does their Facebook live sessions and where one of their editors sits. 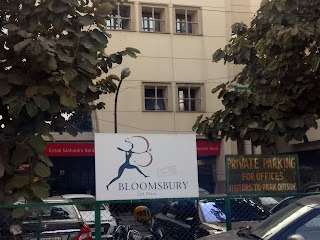 Sneha and I sat with one of Bloomsbury's editors, Himanjali Sankar, and we spoke about books, Sarah J Maas, the role of bloggers in marketing, the young adult market in India and about a couple of books she edited and the one she wrote herself! I'm usually the MOST awkward (and shy) person in any room and being able to talk to someone so easily was kind of BRILLIANT. 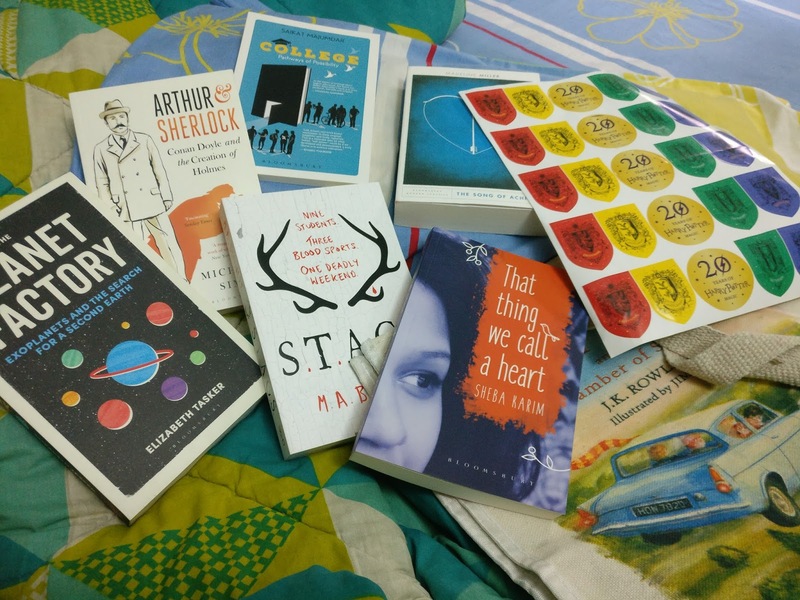 As we were done, we walked back to the marketing department's section of the office and the LOVELY Meenakshi gave me her own copy of a hot of the presses book, That Thing We Call A Heart that I still have to read and I am SO excited for. And that's it. 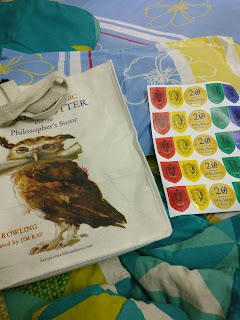 As I was about to leave, Sneha handed me the most GORGEOUS package ever - a Harry Potter Tote Bag, 20th Edition Anniversary Stickers and also a collection of some amazing books that are just down below! This visit was my first tie ever to a publishing office and I WAS SO GLAD that I made the trip because the lovely people at Bloomsbury made every second worth it. I honestly cannot wait to be back in Delhi and meet all of them again. And NOW, what you've all been waiting for: THE UNBOXING! 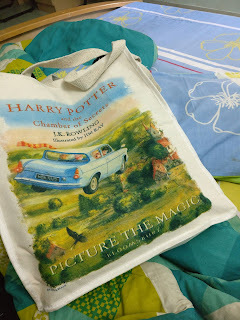 I got the following lovely books all packed inside a Harry Potter Tote Bag and I am SO SO EXCITED to dive into them. There was also a GORGEOUS Sticker sheet with all the Hogwarts Houses which are also the covers for the 20th Anniversary Edition of Harry Potter and the Philosipher's Stone! I absolutely love each and every one of these gifts, just like I ABSOLUTELY loved my visit to Bloomsbury! Thank you so much for having me, Sneha, Meenakshi, Himanjali and the rest of the team!